Douar Samra Location. 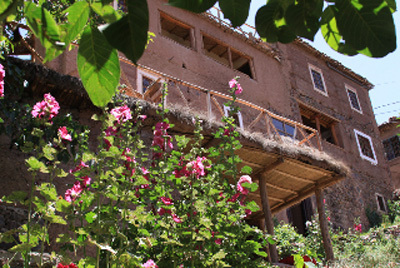 Book Douar Samra Today with Hip Morocco - Holiday Accommodation in Atlas Mountains and Ourika Valley, Morocco. "Homely luxury of a quaint European farm cottage"
Located 10 minutes walk from and breathtakingly looking down over the centre of Imlil, Riad Douar Samra is accessed by walking through the small and very traditional Berber village of Tamatert passing the numerous quaint mud, clay and straw houses, laughing children play gracefully with chickens and sticks as the Berber women hang out their ornate carpets aloft their humble homes. Douar Samra is quite simply stunning, styled on a quaint rickety European cottage, half the property is solely run on candle light. To add to the charm of Douar Samra, Fatima is one of the best Riad chefs in Morocco, producing course after course of the most flavorful, humbly well presented and traditional Berber cuisine available, and always with a welcoming smile. 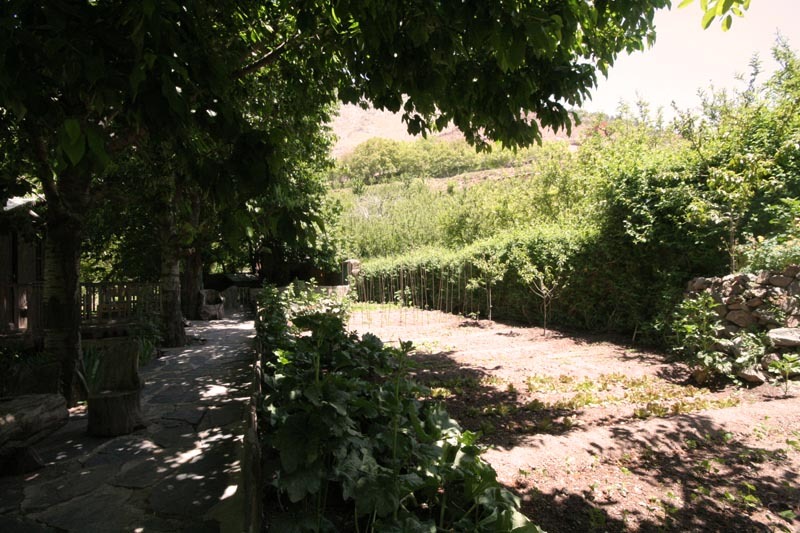 Douar Samra is a Riad in the Atlas Mountains with its own small farm, with animals and allotments supplying Douar Samra with the freshest, most ecological of produce possible. Home to 4 beautiful and friendly Shiz Tzu dogs, creates a wonderfully relaxing and charming atmosphere at Douar Samra. The bedrooms at Douar Samra are petite, cosy and very well constructed with slightly more modern décor in the rooms out of the main building and more rustic crooked rooms in the main building, but all beautifully homely, making guests feel at home throughout. 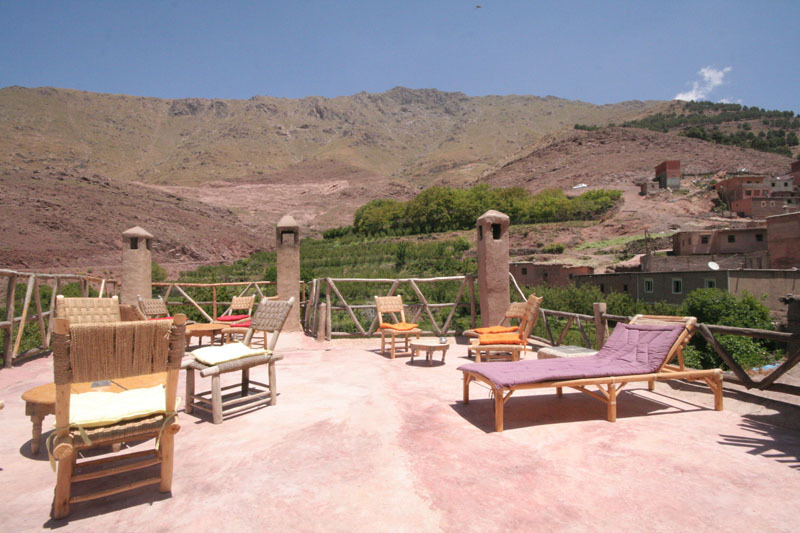 There are a diverse collection of communal seating areas of Douar Samra both open and intimate, all offering wonderful views of the High Atlas Mountains and valley of Imlil below in a cosy homely atmosphere. Several terraces offering panoramic views of the mountains and valley. Breakfast and diner at Douar Samra are included in the price and served in the cosy dining room . Rachida is a wonderful cook growing her own vegetables and shopping for food with care and attention so as to prepare the most authentic traditional Berber home cooked food. A selection of the greatest Moroccan wines is available at extra cost. For an extra £5 a day, lunch can also be provided, either served in the sun on the terrace or packed as a picnic and enjoyed in the wild. Guests' visitors are welcome from lunch, at an cost of £9. Please note that 10% of the price will be reinvested by the official guides to ensure walking around the mountains is safe. 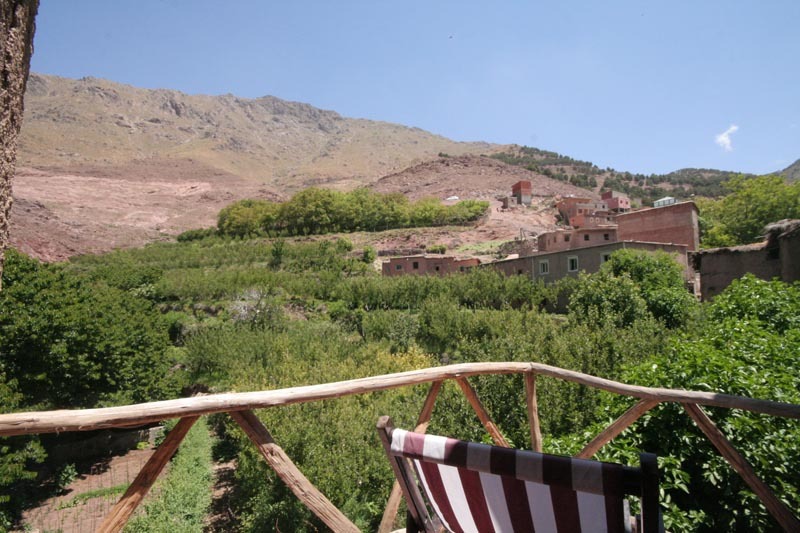 "A wonderful stay in the calm and tranquil setting of the Atlas Mountains. 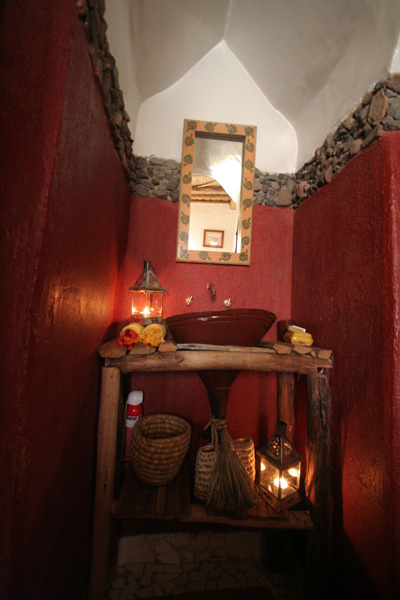 We had a wonderful 3 night-stay in the magical Douar Samra. It really is a haven of peace and quiet, aided by the wonderful cooking and welcome of Rachida and her able staff. From the moment that Jules the mule takes your cases to the front door you are in for a magical experience. Wonderful walking in the mountains, wonderful company with our fellow holidaymakers and a terrific experience overall. Facilities were brilliant, everything you needed in the room down to the very English kettle! Thank you to everyone who made this stay so memorable." "We couldn't have asked for more. The staff is very accommodating and extremely friendly, which adds value to this amazing place (not that it needs it). The views are first class - breathtaking, romantic, atmospheric, beautifully authentic. We have stayed at the tree house, and cherished every moment of our retreat. Peace, tranquillity and blossoming trees. The food is great and vegetarians are well looked after. The location of Douar Samra is great for hiking. Serious about it or not, you will find something that suits your taste. Our two year old loved the donkey and the ducks! "We spent a week up here, loved every minute of it and didn't want to leave. Our room had a glorious view over the mountains, the terraces, and fruit trees in blossom, and we were able to watch the comings and goings of village life from our little balcony. The colours of Morocco were very much in evidence, from the bright clothes of the villagers to the authentic furnishings in the sitting/dining room. Walks are fairly easy, but the summit of Toubkal requires skill and equipment. Thanks to the culinary expertise of Rachida and Mina, and the deft service of Mohammed, we thoroughly enjoyed the varied and delicious meals. What a wonderful experience, begun and ended with Omar, and Jules (?) who carried our baggage from the road. Grateful thanks to Jacqueline for an introduction to Berber mountain culture." 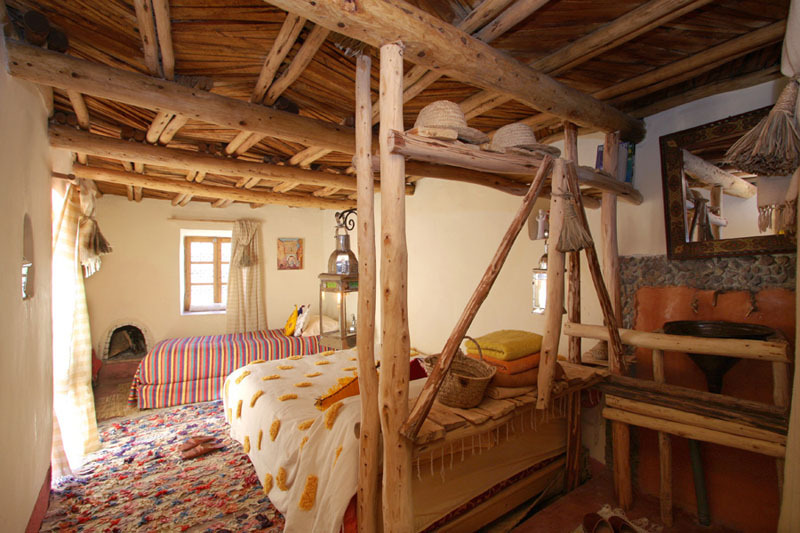 The Yan room is one of two doubles at Riad Douar Samra created in the style of a small rickety countryside cottage. In keeping with an ecological theme, the Yan rooms is run entirely off candlelight and has a small balcony with breathtaking views looking over the Moroccan High Atlas Mountains and Imlil below. 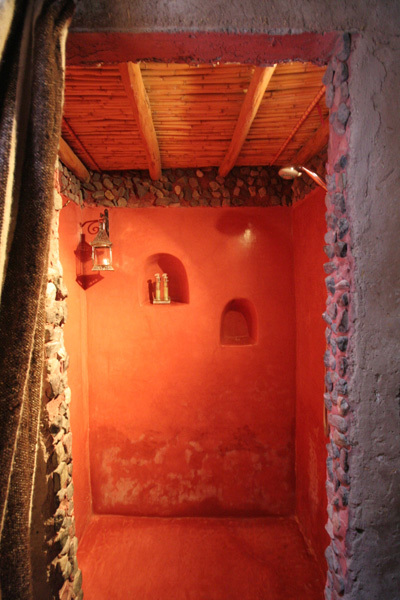 There is a small cosy low seating area next to a working fireplace, perfect for honeymoon ideas and a romantic getaway in the Atlas Mountains. 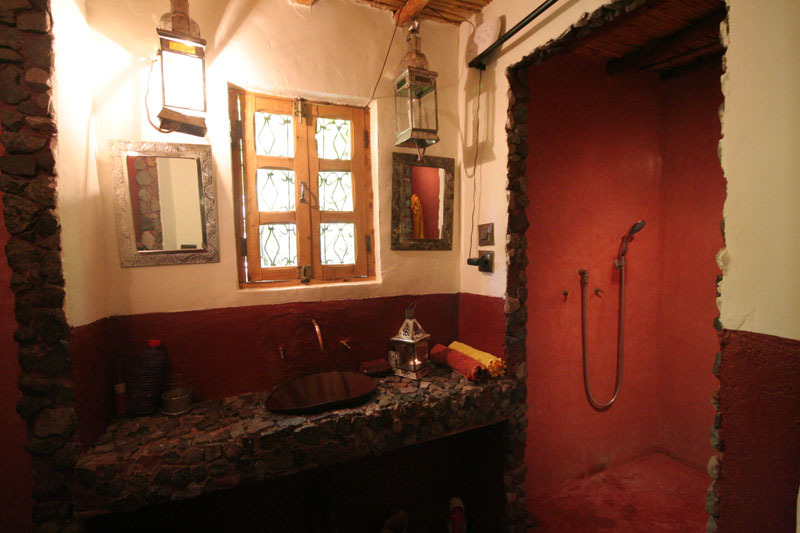 The quaint bathroom has a shower and some beautiful Berber tiling along with Moroccan life artwork donning the walls. 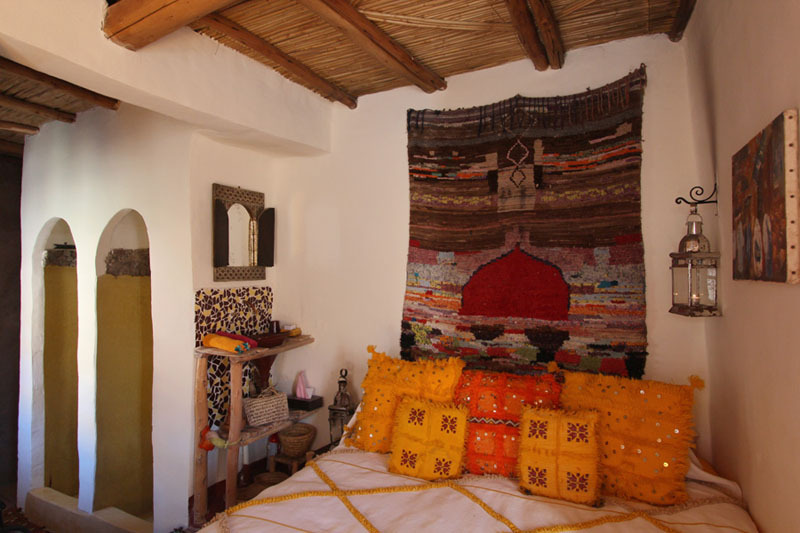 The Sin room is the other double room at Douar Samra, with a collection of creative Berber and African artwork and furnishings throughout. The low sofa seating area next to the working fireplace and small library creates a wonderfully warm atmosphere for chilly intimate mountain nights at Douar Samra beautifully crafted for a romantic holiday in Morocco. 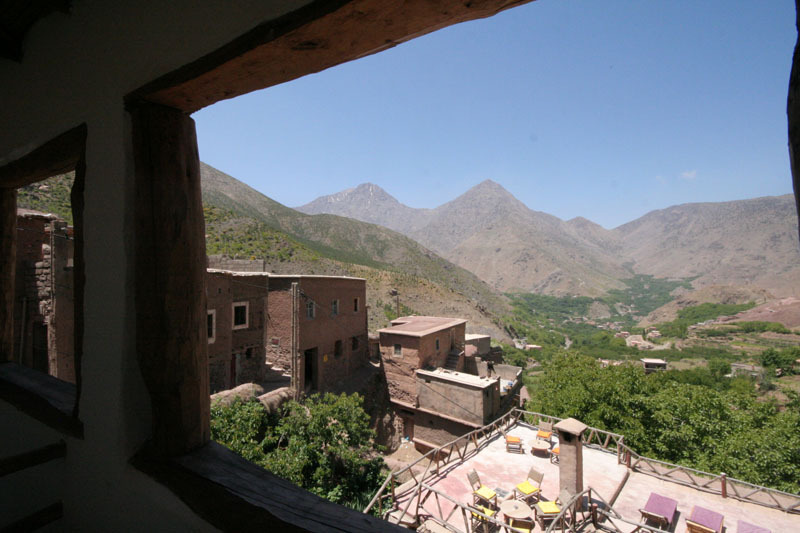 The Sin room at Douar Samra has two balconies with views down the valley of Imlil village and up to the traditional Berber village of Tamatert with its mules, farmland and joyful playing children. 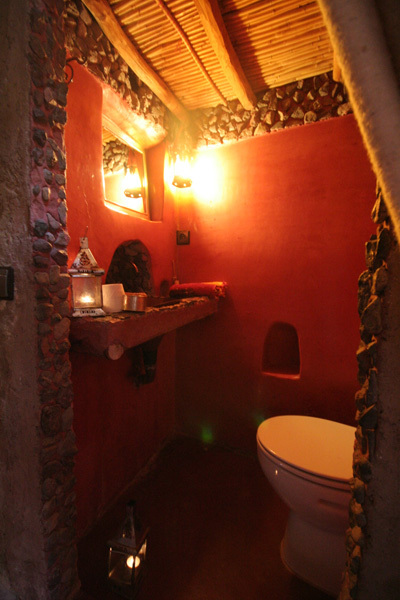 The bathroom sink is in the room next to two door-less cubicles for WC and shower in a quaint intimate style powered only by romantic candlelight throughout. The Kran room at Douar Samar is a triple room with double bed and separate single bed. 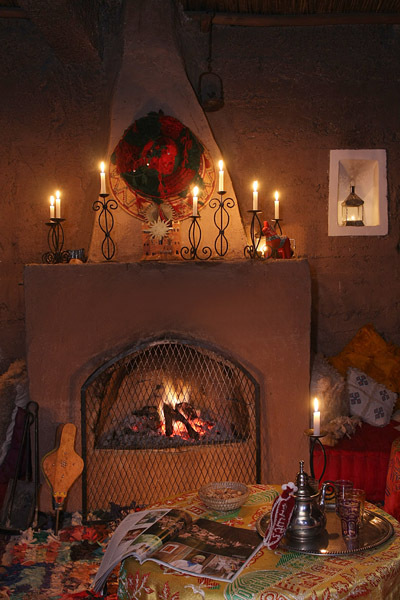 The room has no electricity, but candle lanterns throughout, creating the perfect atmosphere for a small family holiday in the Atlas Mountains, along with two working fireplaces, this room brings people together. 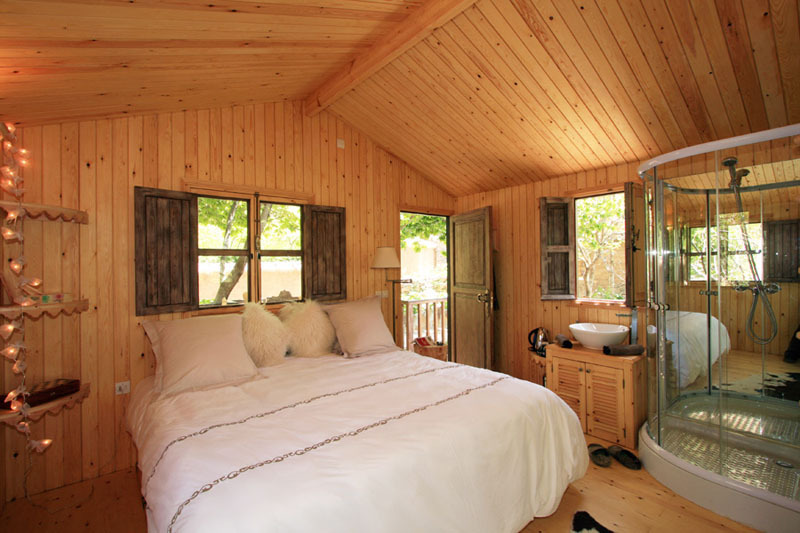 The Kran room has a low cedar beam ceiling in the style of a cosy European cottage. The cosy bathroom has a shower and beautiful Berber tiling. 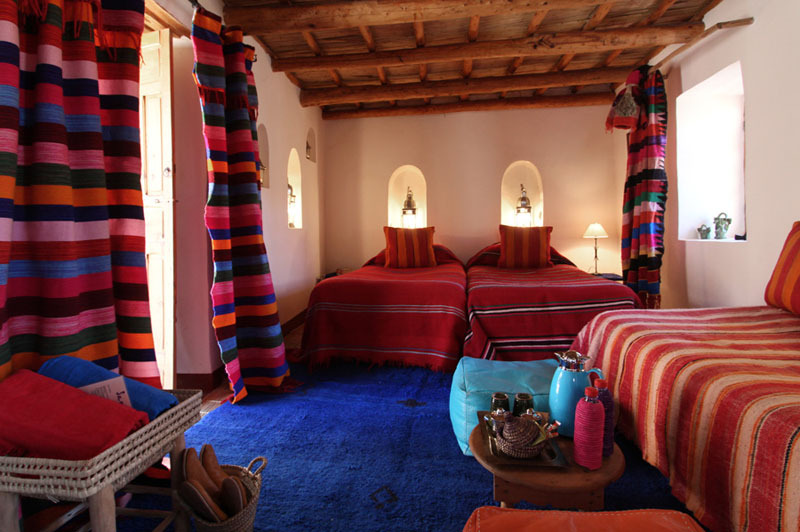 This room is run solely of candle-light taking guests back into an intimate traditional Berber village house. This room has cosy single and double bed with working fireplace built into the wall. The large colourful Berber carpet creates a warm homely atmosphere. This room has a large terrace looking down the valley towards Imlil with wonderful views of the towering High Atlas Mountains beyond. 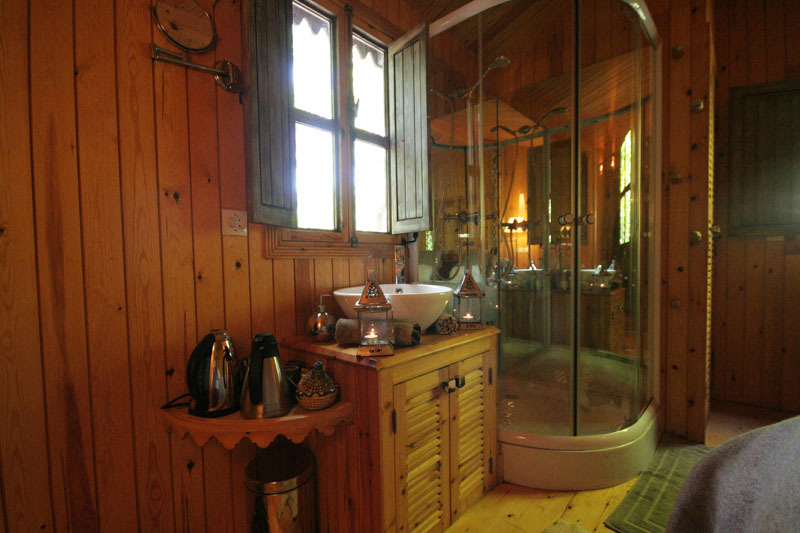 The intimate bathroom has a cosy shower complimented by the flickering candle-lighting. The Mouss room has 4 single beds, three on the upper mezzanine and one on the lower. This room at Douar Samra has a cosy barn feeling to it, with low criss-crossing cedar wood roof beams and beds close together but still allowing a good amount of space. The lower mezzanine has a fireplace along with quaint bathroom and shower. 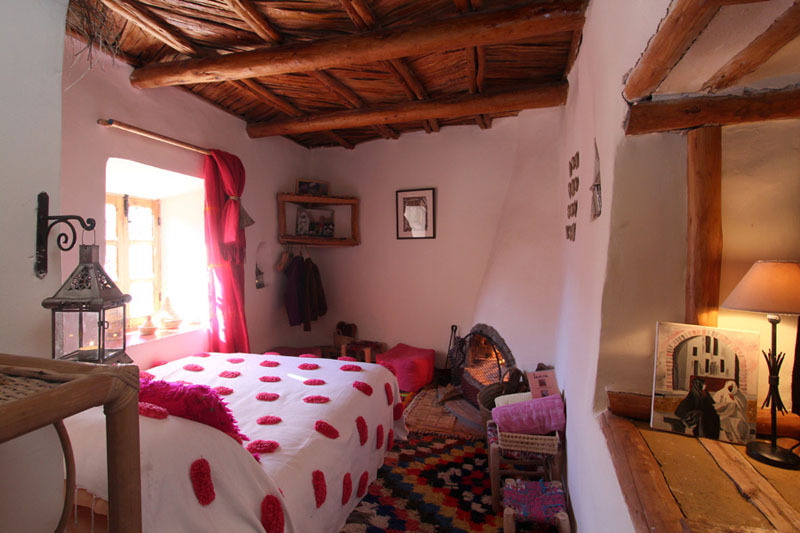 This room has a small library of books from around the world making it the perfect choice for a group holiday in the Atlas Mountains, or family vacation in Morocco. The Sdez room is a cosy triple with 3 single beds among a colorful array of traditional Berber carpets, curtains and portrait artwork. There is a small library of world books alongside the balcony with wonderful views of the Moroccan High Atlas Mountains. 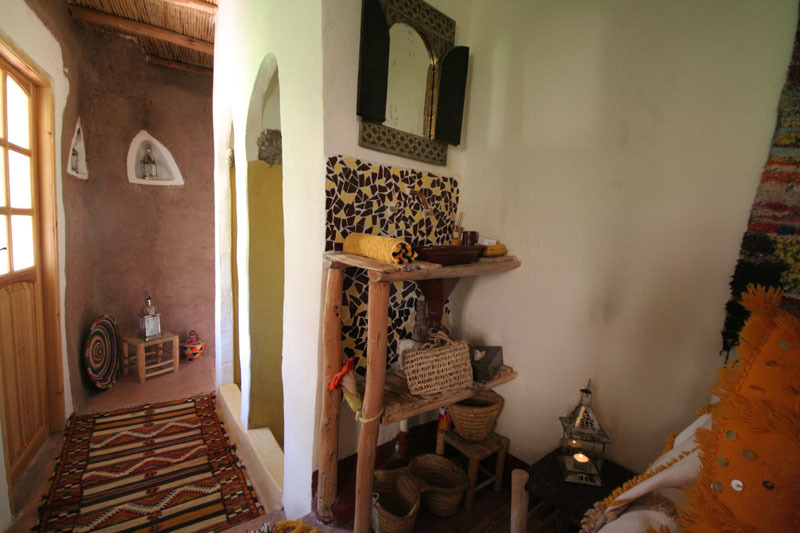 This room at Douar Samar has a cosy bathroom with shower and thick chilly morning feet-warming rug. 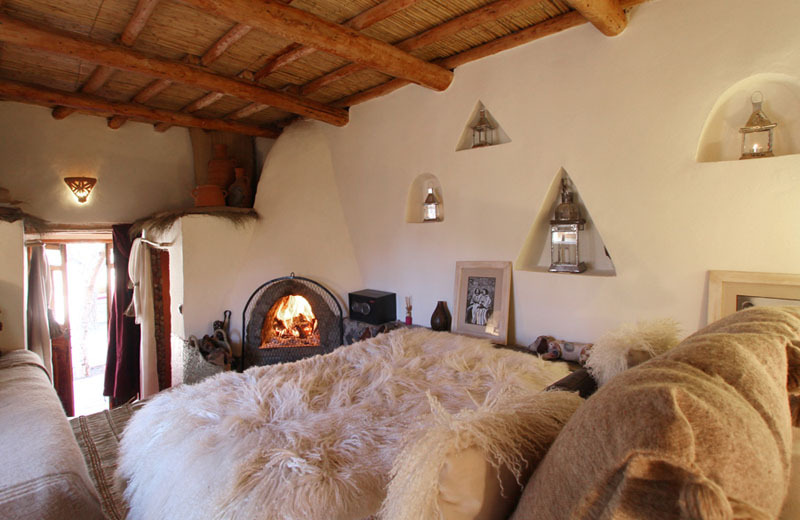 The Sabat room is a small triple room with traditional shaggy Berber sheep-fur bed coverings complemented by the warming in room fireplace. 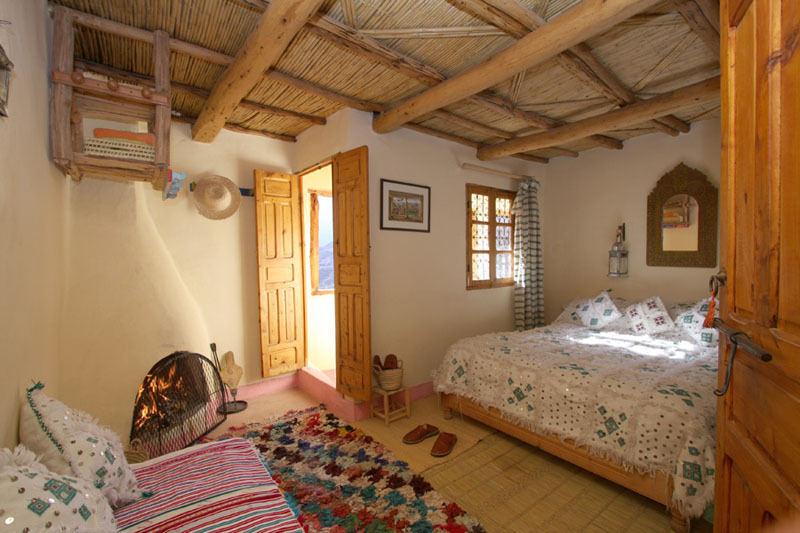 This room at Douar Samra has a large double bed and single bed and traditional Berber artwork furnishings, very well suited for a couple and a friend, or small family holiday in Morocco, to bring people together after an active days hiking in the breathtaking surrounding Moroccan Atlas Mountains. This room at Douar Samar is at garden level, opening out onto the Riad allotment with its humble abundance of fresh fruit and vegetables. The Sabat room has a small bathroom with shower on the lower level. 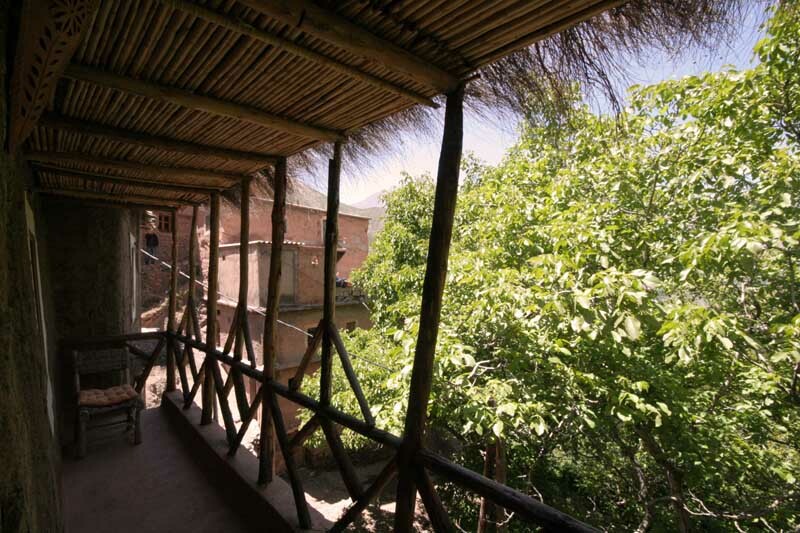 The Tree house at Douar Samra is a cosy double with in room bathroom and shower, set away from the main building providing a calm and tranquil atmosphere. 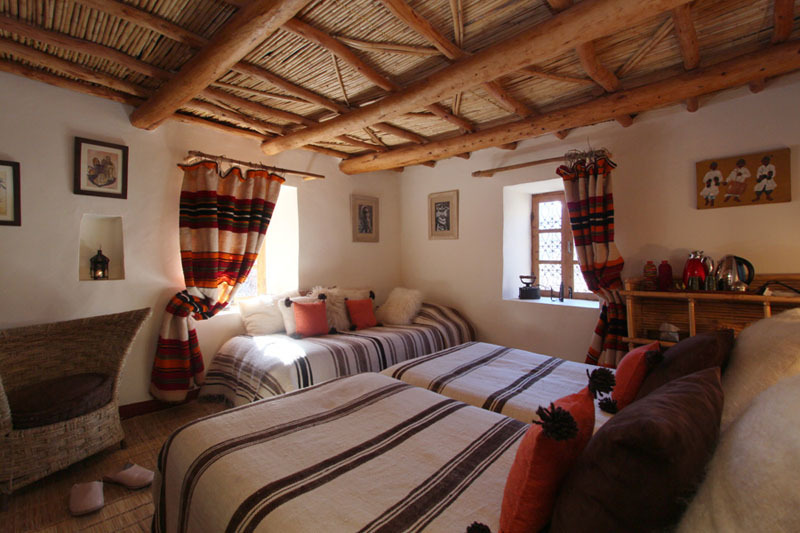 The room has a large double bed and beautifully decorated with traditional Berber furnishings, complimented by the complimentary jeleba and Berber slippers for the duration of your stay. 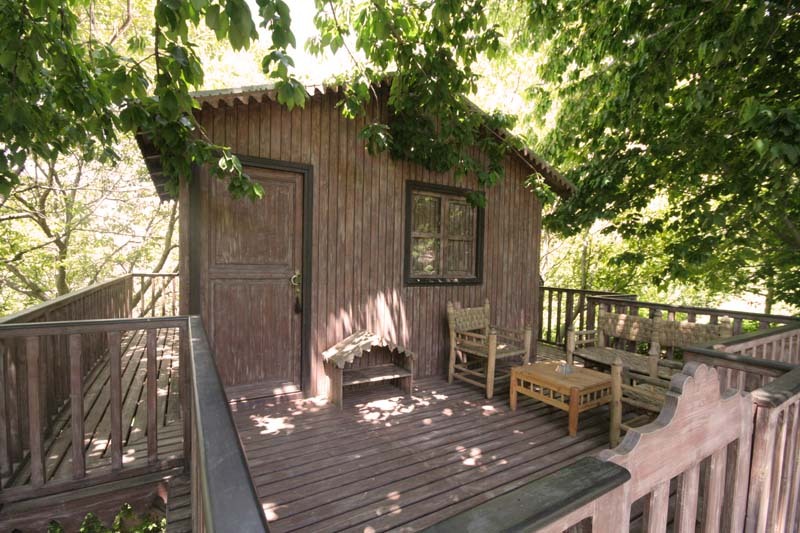 The Tree house has a wooden front porch with seating area, located next to the Riads allotment. 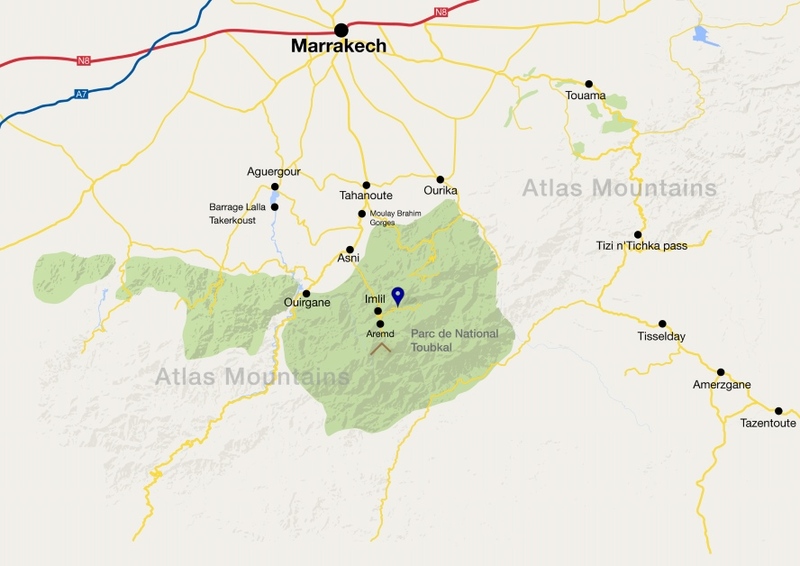 The base rate price at Douar Samra is in pounds, euros, or Moroccan dirhams and exchange rates are approximate.